Agilent Technologies Inc. (NYSE: A) recently announced shipment of the latest release of its Electromagnetic Professional software, EMPro 2011.11. The updated 3-D modeling and simulation platform features enhancements to further speed and improve RF design and verification. A fast FEM iterative solver that doubles the speed of simulations that include internal ports (which had already been doubled in the previous release). This continuous improvement reflects Agilent's ongoing commitment to fast-paced advancements in simulation technology. 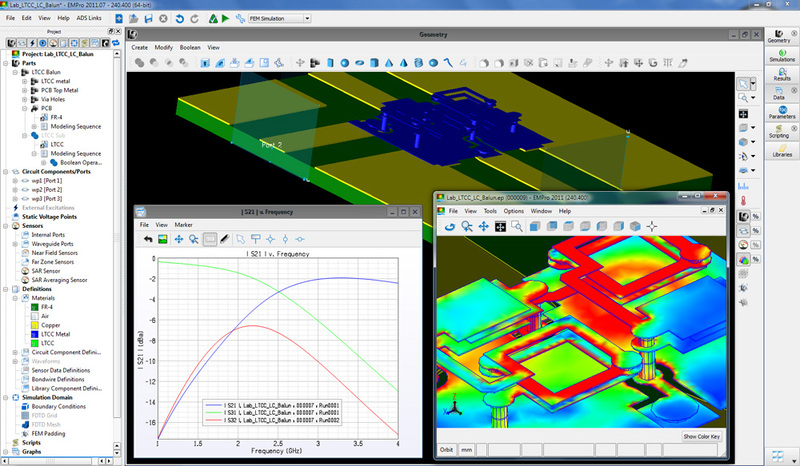 A fast, two-dimensional port solver that simplifies FEM simulation port setup. The solver allows users to quickly and easily determine the number of modes, as well as reference impedance and optimum impedance line placement. The EMPro 2011.11 release is now available for download. Pricing for the EMPro environment starts at $7,000. Interested parties can evaluate the software by applying for a trial version at www.agilent.com/find/eesof-empro-downloads-and-trials. They can also download application examples at edocs.soco.agilent.com/display/eesofapps/EM+Applications. These examples cover a wide range of topics, including packaging, antennas, RF PCBs, RF modules, connectors and radar applications. More information on EMPro 2011.11 is available at www.agilent.com/find/eesof-empro2011.11. Photos of the new software release are available atwww.agilent.com/find/ADS_EMPro_2011_images.